The Zia Pueblo boasts fewer than 700 residents, but its fame doesn’t come from its size, but rather its symbol—the Zia sun symbol, adopted as the official state insignia of New Mexico in 1920. 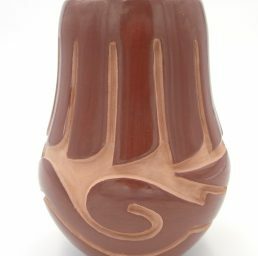 Like the symbol of the pueblo, the pottery from Zia artists is easily recognizable and reflective of cultural values. 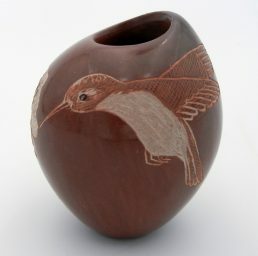 The pottery of small Pueblos often has similar characteristics to that of neighboring Pueblos. 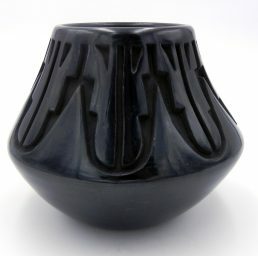 But despite its size, Zia Pueblo’s pottery style and designs are very distinct from other Native American Indian pueblos’. 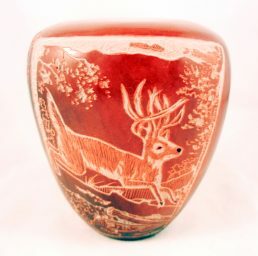 Made from clay collected on the Pueblo, unpainted Zia Pueblo pottery turns a deep red when fired. A white slip is often applied to create a buff-colored painting surface. 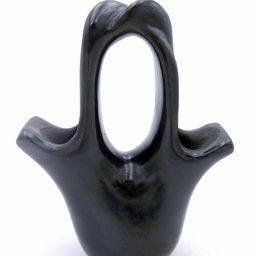 Designs are mostly painted in black and red and orange hues. 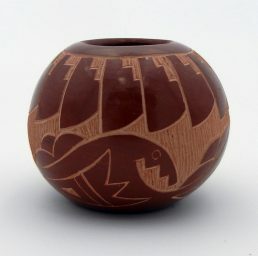 The Zia sun symbol does make its appearance on some pottery, but Zia Pueblo artists are more commonly known to use the “sky band” and Zia bird designs. The “sky band” is a broad arcing ribbon of color that often frames more intricate patterns. The Zia bird is a large-eyed bird with wings upraised and a two- or three-pronged tail. 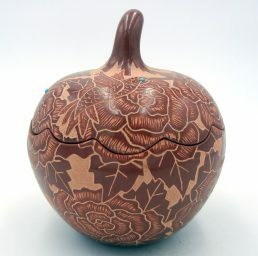 In addition to these patterns, Zia Pueblo artists also create geometric and floral designs. 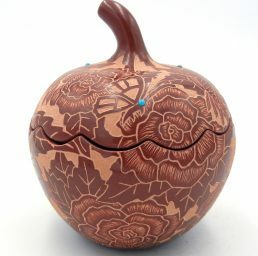 There are very few Zia Pueblo pottery artists remaining, but the ones who continue to practice the cultural tradition are making awards—literally. 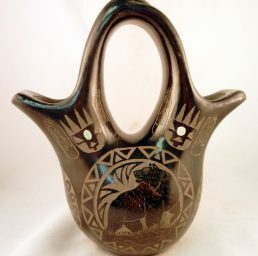 Elizabeth and Marcellus Medina designed the New Mexico Bowl trophy, which features the Zia sun symbol as well as other symbols significant to the Zia people: deer, mountain lion, buffalo and eagle. Fellow potter and artists Ralph Aragon modeled the trophies for the Outstanding Offensive and Defensive Players from traditional leather shields. 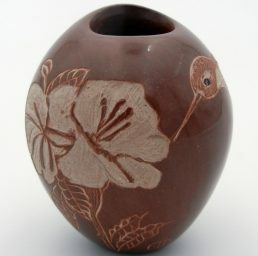 Although a small Pueblo, Zia Pueblo is an important part of the Native American Indian pottery tradition, and Palms Trading Company is proud to carry their work. 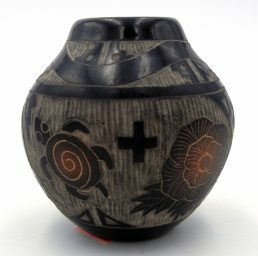 Every Zia Pueblo pottery piece is bought directly from the artist, so it is guaranteed authentic. 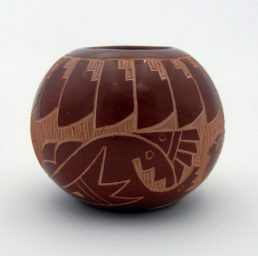 In comparison to pottery art from other Pueblos, the selection of Zia Pueblo pottery is small. However, we do carry a larger selection in our store. 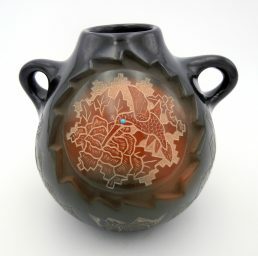 If you’d like to view more Zia Pueblo pottery, please contact us to use our personal shopper service.